Thank you for checking out this book by Theophania Publishing. We appreciate your business and look forward to serving you soon. We have thousands of titles available, and we invite you to search for us by name, contact us via our website, or download our most recent catalogues. 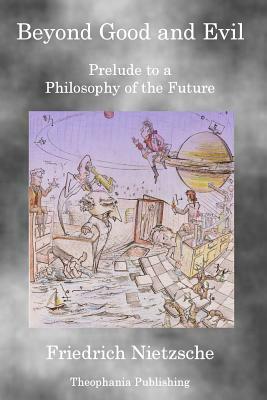 Beyond Good and Evil (German: Jenseits von Gut und B se), subtitled "Prelude to a Philosophy of the Future" (Vorspiel einer Philosophie der Zukunft) It takes up and expands on the ideas of his previous work, Thus Spoke Zarathustra, but approached from a more critical, polemical direction. In Beyond Good and Evil, Nietzsche attacks past philosophers for their alleged lack of critical sense and their blind acceptance of Christian premises in their consideration of morality. The work moves into the realm "beyond good and evil" in the sense of leaving behind the traditional morality which Nietzsche subjects to a destructive critique in favour of what he regards as an affirmative approach that fearlessly confronts the perspectival nature of knowledge and the perilous condition of the modern individual. Friedrich Wilhelm Nietzsche (October 15, 1844 - August 25, 1900) was a 19th-century German philosopher and classical philologist. He wrote critical texts on religion, morality, contemporary culture, philosophy and science, displaying a fondness for metaphor, irony and aphorism. Nietzsche's influence remains substantial within and beyond philosophy, notably in existentialism and postmodernism. His style and radical questioning of the value and objectivity of truth have resulted in much commentary and interpretation, mostly in the continental tradition. His key ideas include the death of God, perspectivism, the Ubermensch, the eternal recurrence, and the will to power. Nietzsche began his career as a classical philologist before turning to philosophy. At the age of 24 he was appointed to the Chair of Classical Philology at the University of Basel (the youngest individual to have held this position), but resigned in 1879 due to health problems that plagued him most of his life. In 1889 he went insane, living out his remaining years in the care of his mother and sister until his death in 1900."